Taste of Thai Broadmeadows uses their own specialised couriers to deliver their food. Crumbed chicken beast fillet served with sweet chilli sauce. Thai style prawn cracker served with our famous peanut sauce. Fish paste with Thai spice served with sweet chilli sauce. Thai style mix vegetable and glass noodle serve with sweet chilli sauce. Finely chopped vegetable with mid curry powder encased in puff pastry. Marinated and cooked with our recipe, served with sweet chilli sauce. Deep fried soft bean curd served with peanut sauce. Chicken and prawn marinated encased in egg pastry and steam served with sweet chilli and soya sauce. Marinated chicken breast strips, skewered and bbq served with our Thai style peanut sauce. Kings prawn marinated with soya sauce and pepper deep fried in special batter served with sweet chilli sauce. Homemade crumbed calamari rings served with sweet chill sauce. Marinated tiger prawns with turmeric and coriander with peanut sauce. Deep fried tofu with salt and pepper garlic and chilli. Deep fried squid seasoned with salt and pepper garlic chili. Deep fried prawn seasoned with salt and pepper garlic and chilli. Deep fried soft shell crab with salt & pepper garlic and chilli. Traditional hot and sour soup flavoured with galanga lemon juice, and mushroom. Light coconut milk soup flavoured with galanga lemon juice, chilli and mushroom. Spicy and sour soup flavoured with lemon grass, galanga, lemon mushroom, fresh Thai basil and chilli. With potato, tomato, onion, celery, lemon juice and chilli. Authentic Thai style green curry paste coconut milk, vegetable and basil. Authentic Thai style red curry paste coconut milk, vegetable and basil. Thai style slow cooked meat in massaman curry paste. Authentic Thai style panang curry paste coconut milk vegetable and lime leaf. Thai style curry powder and chilli paste coconut milk onion, potato and tomato. Prawn or fish fillet cook in choochee curry vegetable, coconut milk and crushed nut. Spicy country style red curry without coconut milk, herb, vegetable and Thai basil. Authentic Thai style red curry paste coconut milk duck slice, vegetable, pineapple, cherry tomato and Thai basil. Authentic Thai style green papaya, bean, cherry tomato, dried shrimp, lemon juice and bird's eye chilli. Deep-fried tofu with fresh chilli, tomato, cucumber and lemon sauce. Fresh garden salad with deep fried tofu, boiled eggs and special homemade peanut sauce. Fillet of chicken, grilled and sliced, tossed with authentic Thai style chilli jam, snowpeas, shredded coconut and lemon sauce. Fillet of chicken grilled and sliced with authentic Thai style chilli, tomato, cucumber and lemon sauce. Fillet of beef grilled and sliced with authentic Thai style chilli, tomato, cucumber and lemon sauce. Roasted duck fillet with lemon, chilli, Spanish onion and mint. Prawn or squid or mixed seafood flavoured with chilli, lemon grass and Spanish onions. Fresh garden salad with apple, cherry tomato, deep fried crumbed prawns and Thai style creamy dressing. Deep fried soft shell crab in special coating dressed with authentic Thai style chilli and lemon, cherry tomato cucumber and mint. Tender chicken or beef fillet marinated in Thai spice and BBQ in real Thai tradition. Tender beef fillet marinated in Thai style and BBQ served with special chilli sauce on side. Tender lamb fillet marinated in Thai lamb fillet marinated in Thai spice ginger and turmeric. Grilled marinated king prawns served with fresh chilli garlic and lemon sauce. Deep fried tofu with Thai style sweet tamarind sauce on a bed of mixed vegetable. Prawn in batter with Thai style sweet tamarind sauce on a bed of mix vegetable. Stir-fried with pineapple vegetable in sweet and sour sauce. Stir-fried with fresh ginger baby corn and vegetable. Authentic Thai stir fried with special chill sauce served on hot plate. Stir fried red curry paste with vegetables, chilli, young pepper corn, mixed Thai herbs and basil. Stir fried homemade chilli paste with bean, capsicum, onion and lime leaf. Stir fried of your choice with vegetable and top with peanut sauce. Stir fried capsicum, onion, broccoli, carrot and zucchini in a black bean sauce. Stir fried king prawn, snow pea, mushroom, baby corn with oyster sauce. Stir fried vegetable with sesame oil and top with sesame honey sauce. Stir fried pumpkin, snow pea, mushroom, baby corn, capsicum and egg. Stir fried eggplant with onion, fresh chilli, vegetables, oyster and soy bean sauce. Stir fried sweet soy sauce and honey with steamed vegetables. Green curry paste with mixed vegetable stir fried with a touch of creamy coconut sauce. Stir fried vegetable with sweet chilli sauce. Thai style fried rice with green curry paste, eggs, vegetables and Thai basil. Taste of Thai style fried rice of your choice with egg, onion, tomato, pea, corn and carrot. Thai style fried rice with chilli, egg, onion, bean, capsicum and basil. Thai style fried rice with tom yum flavours lemon grass mushroom coriander and eggs. Popular stir fried rice noodle with egg, fresh tofu, bean sprouts and crushed nut on the side. Stir fried thick rice noodle in black sweet soya sauce, egg, Chinese broccoli and bean sprouts. Stir fried thick rice noodle, chilli, bean sprouts, shallot, egg and Thai basil. Stir fried Hokkien noodle with soya sauce, egg, Chinese broccoli and bean sprouts. Stir fried thick rice noodle top with choice of your meat and vegetable gravy. Deep fried egg noodle top with choice of your meat and vegetable gravy. 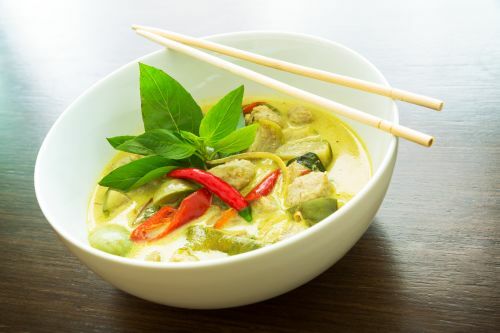 Your choice of green, red or yellow curry stir fried with thick rice noodle. Stir fried thick rice noodle with vegetable, egg, fresh chilli and Thai basil. Maggie noodle stir fry with egg, peas, corn, carrots and Chinese broccoli. Egg noodles with Chinese broccoli, bean spouts, topped with our famous BBQ chicken. Egg noodles with Chinese broccoli, bean sprouts, topped with our famous crispy chicken. Authentic Thai style curry noodle soup, with deep fried tofu, vegetable, crushed nut and fried onion. Minced chicken in clear soup with fish ball, bean spouts and fried wonton. Authentic Thai style slow cooked beef soup with sliced beef and beef ball. Authentic Thai style slow cooked soup, simmered with slices of chicken tight, Thai herbs and thin rice noodle. Thai style slow cooked soup with vegetable and roasted duck. Mixed seafood in clear soup with bean sprouts and Chinese broccoli.